The Irish-born Australian international improves on her own world masters record, while at home athletes were in action at the AAI Games, National Masters Cross Country Championships and lots more. 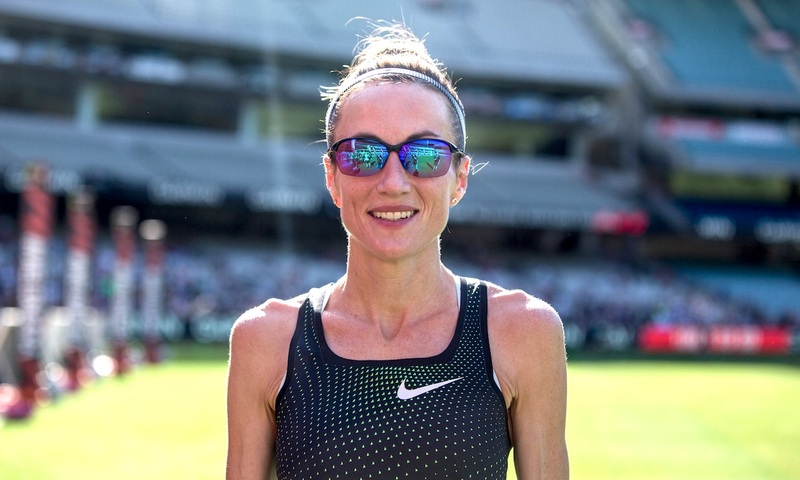 Australian-based Sinead Diver produced the result of the weekend for Irish-born athletes when she ran a personal best 68:55 to finish third woman at the Marugame Half Marathon in Japan on Sunday (February 3). The Mayo native went through 5km in 16:06 and 10km in 32.18, underlining her superb form at the moment as she knocked 25 seconds off her previous best. Diver, who turns 42 later this month, improved her own over-40 world record by over a minute. If the 2:25 marathoner was competing for Ireland it would have been a new national record over 13.1 miles. The Melbourne Track Club athlete finished ahead of training partner Charlotte Purdue, while the winner for a second year was the Kenyan Betty Saina in 67:69. Second was Ayuko Suzuki of Japan, running 67.55 in her half marathon debut. Locally, capacity crowds turned out for the John Treacy 10 Mile held in Dungarvan and the Trim 10 Mile in Co Meath on Sunday (February 3). Kevin Maunsell and Grace Lynch were the winners in Dungarvan. 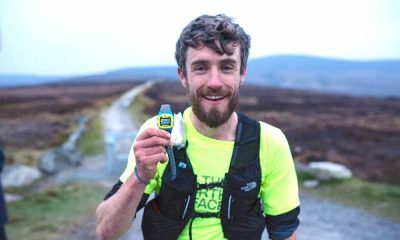 Former international race walker Colin Griffin of Ballinamore AC was the winner in Trim with a time of 53 minutes exactly. The evergreen Catherina McKiernan of Cornafean AC won the women’s race in 60:04. Thomas Barr opened his hurdling season with an easy win in the rarely-raced indoor 400m hurdles at the AAI Games in Abbotstown on Saturday (February 2). “Messy little rust buster tonight over the sticks, but still good fun for something different,” tweeted Barr after this unusual race where the hurdles were positioned on the straights. His time was 52.81 secs. Sophie Becker of St Joseph’s and Lauren Roy from City of Lisburn both notched up qualification times for the European Indoors next month. In the 60m, Roy clocked a personal best time of 7.39 secs, with Ciara Neville of Emerald AC a close second with 7.41. The European Indoor qualification mark is 7.40 secs. Becker won the 400m in 53.66 with Beechmount’s Davicia Patterson second in 54.29. Back in action after a long period of injury was Sharlene Mawdsley of Newport AC who ran a time of 55.45. The European Indoors qualification mark is 53.75 secs. Improving the Irish record to 11:06.69 in the 3000m indoor race walk was Alex Wright. Kate Veale of West Waterford won the women’s 3000m walk in 13:50.05. Winning a closely fought men’s 800m in 1:49.69.was Conall Kirk of Annadale Striders. On his heels was Mark Milner of Tullamore Harriers with a time of 1:49.75, while third in 1:50.90 was Shane Fitzsimons of Mullingar Harriers. Qualification mark for the European Indoors is 1:49.00. Nadia Power of Templeogue AC ran 2:07.28 to win the women’s race. Over 1500m, European U20 champion Sarah Healy of Blackrock AC won the women’s race in 4:17.78. Amy O’Donoghue of Emerald AC was second in 4:18.82 with Kelly Neely from City of Lisburn AC third in a new W40 national record of 4:23.36. Qualification mark for the European Indoors is 4:15 or 4:33 in the mile, a standard already attained by Ciara Mageean. In the men’s 1500m, Donore’s John Travers kicked hard to win in 3:44.56 with Luke McCann of DCH second in 3:45.50 and Paul Robinson of St Coca’s third in 3:45.69. Cian McPhillips of Longford AC. Aged 16, was fifth in a new national youth record time of 3:46.42. Winning the men’s 60m hurdles in 7.97 seconds was reigning national indoor champion Matt Behan of Crusaders AC. Sarah Lavin of UCD won the women’s 60m hurdles in 8.44 secs. In the jumps, a personal best 6.15m saw Ruby Millet of St Abban’s AC inside the qualifying standard for the European U20 championships. Her clubmate Saragh Buggy continued her long triple jump winning streak with a 13.11m effort. Closing out the meet were 4×400m relays won by the U20 women’s and men’s teams in times of 3:45.27 and 3:16.78. The top six nations from the 2018 outdoor lists will compete at the European Indoors. In the Lincoln, Nevada, also on Saturday, Kevin Kelly of St Coca’s ran a time of 4:01.47 for the mile. At the opening day of the Dublin Juvenile Championships in Abbotstown on Friday (February 1), Rashidat Adeleke was back in action, anchoring Tallaght AC to victory over Dundrum South Dublin AC in the U18 4×100. Gina Akpe-Moses of St Gerard’s AC was in action at the ISTAF meeting in Berlin on Friday (February 1) where she ran a personal best time of 7.45 secs to finished fourth in her 60m heat. 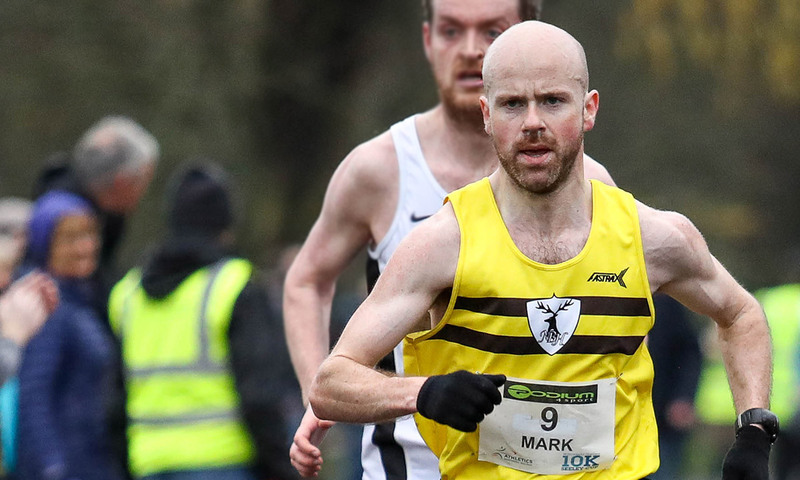 Pre-race favourite Mark McKinstry of North Belfast Harriers lived up the expectations when he won the men’s race at the National Masters Cross Country Championships at Dundalk IT on Sunday (February 3). It’s been a great season for McKinstry who hasn’t looked back since his victory at the British and Irish Masters Cross-Country International last November. In a strong field, he came home ahead of Dublin and Leinster champion Rossa Hurley of Donore Harriers and Eoin Flynn of Rathfarnham WSAF, who had flown in from his base in the Canary Islands for the occasion. First M40 was Mark Ryan of Rathfarnham WSAF AC; other age group winners were Declan Reed of City of Derry Spartans M45, Shane Healy from Metro St Brigid’s AC M50, Mick Byrne of Sli Cualann AC M55, Tommy Payne of Tinryland M60, Paul Elliott of Beechmount Harriers M65, Martin McEvilly of Galway City Harriers M70 and Jim Langan from Tullamore Harriers M70. With three finishers in the top nine, Rathfarnham WSAF AC won the M35 team category, finishing comfortably clear of Finn Valley AC and Thurles Crokes AC. Dublin was first county beating Cork and Sligo. On a good day for North Belfast Harriers, the M50 team took gold, with Slaney Olympic second and Mullingar Harriers third. Dublin was first county, followed by Antrim and Wexford. Clonliffe Harriers was first M65 team with Dublin first county. Winning the women’s race was Martina Kiely of St Finbarr’s AC, who finished in 14:23. Kate Purcell of Raheny Shamrock Ac was second and Laura McDonnell of Tallaght AC third. Among the age group winners was Annette Kealy of Raheny Shamrock W50; Niamh O’Sullivan of An Riocht AC W55, and Mayo AC pair Pauline Moran and Margaret Glavey first W60 and W65 respectively. Joan Coyle of DSD AC was first W70. Raheny Shamrock won the W35 team title from St Finbarr’s and Sportsworld AC, with Dublin ahead of Cork and Louth in the county standings. Best of the W50 teams was City of Derry Spartans, followed by Mayo AC and Sligo AC. First county team was Derry followed by Cork and Dublin. Winning an absorbing the men’s intermediate title in 23:31 was Sean O’Leary of Clonliffe Harriers, who just made it to the line ahead of Dublin champion Mitchell Byrne of Rathfarnham WSAF, who finished in 23.32. Finishing third in 23.43 was Paul Maloney of Mallow AC, with Mark Molloy of Dundrum South Dublin AC two seconds behind for fourth. North Belfast Harriers proved best of the teams ahead of Clonliffe Harriers and Rathfarnham WSAF third. Antrim was first county ahead of Dublin and Offaly. Sheryl Nolan of St Abban’s took a solid victory in the women’s race, finishing in 18:45. Lauren Dermody of Castlecomer AC was second and Nadine Donegan of Tullamore Harriers third. Winning the team title was Mullingar Harriers with Sligo AC second and Sportsworld AC third. Kilkenny proved best of the counties, with Dublin second and Westmeath third. 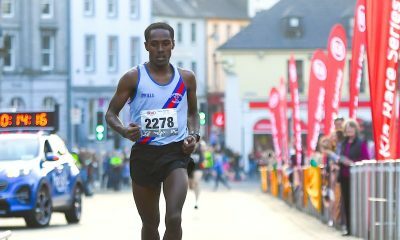 Efrem Gidey finished a fighting fifth for Clonliffe Harriers in the U20 men’s 4.3km race at the European Clubs Cross Country Championships in Albufeira, Portugal on Sunday (February 3). Gidey’s time of 19:16 put him just 23 seconds behind the winner Edward Pingua of Sporting Lisboa e Benfica. Clonlifffe finished 11th of the teams, with Stephen Cashin 53rd, Aaron Cullen 57th, Jordan Byrne 58th and Ben Guiden 67th. Orla O’Connor finished 18th for Waterford AC in the U20 women’s 2.5km race, followed by Ruth Heery 28th, Emma Caulfield 37th, Anna O’Connor 50th, Anna Duffin 58th and Carla Fanning 61st. Emine Akbingold of the winning Turkish team from Fenerbahce SC won the race. Waterford finished 9th. Leading Leevale AC home in the women’s 4.3km race was national steeplechase champion and Olympian Michelle Finn who finished 18th. With Dylan Hassett 24th, Sinead O’Connor 44th, Carol Finn 54th, Niamh Moore 58th and Michelle Kenny 63rd, the team finished 8th. Race winner was Fancy Cherono of Sporting Clube de Portugal. In the senior men’s 8km, Mick Clohisey finished 26th for Raheny Shamrock, followed by Kevin Dooney 43rd, Michael McMahon 72nd. Kevin Moriarty 77th, and Des Kennedy 88th; the team was 12th. Race winner was Jacob Kiplimo of the Italian Casone Noceto Club, who beat David Kiplangat of SC de Portugal by a single second. Winners of the Garda BHAA Cross Country races in Dublin’s Phoenix Park on Saturday (February 1) were Eoin Healy in the men’s four-mile and Niamh Allen in the women’s two-mile, which attracted a record 252 finishers. A total of 183 men finished the four-mile race. 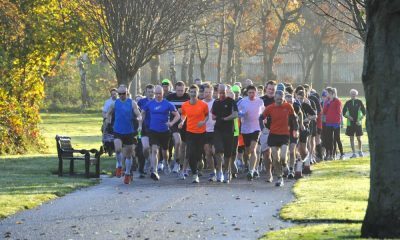 Bank of Ireland won the men’s grade A team category, while best of the women’s teams was Health A.
Padraig Moran ran 15:36 in Mullingar event to record the fastest men’s time at parkrun events across Ireland on Saturday (February 2). Jessica Craig ran a quickest women’s time in 17:14 at the Belfast Victoria event, while Lizzie Lee was the second fastest after a 17:44 run at the Ballincollig parkrun. 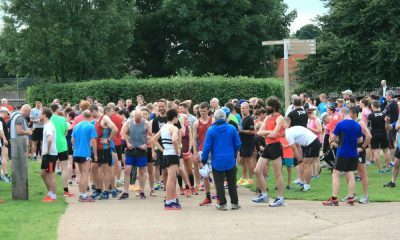 The top 10 parkrun times can be found here.